The only solution is a winch! 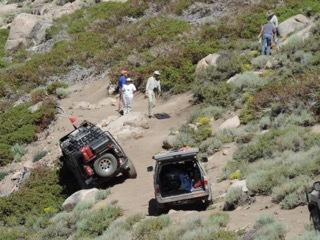 While the Getting Started clinic touches briefly on winching, the topic deserves a full day of instruction and practice. 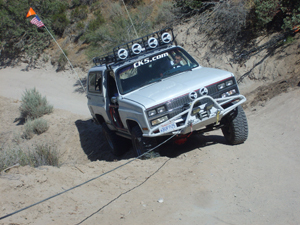 If you are considering installing a powered winch on your vehicle, or have one already but need training to learn how to get the best from it and do it safely, you need to take this class. This clinic is held near Mojave, CA or near Borrego Springs, CA. This is a hands on class. 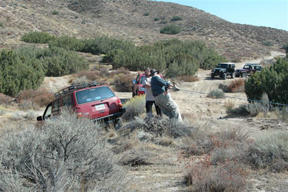 If you do not have a winch on your vehicle, you will be paired up with another student. The class is limited to 10 vehicles. No more then 5 vehicles without winches will be allowed. For this class you must have a street legal, insured 4WD with a low range transfer case. You must have at least one recovery hook (or recovery point) on the front and one on the rear. You need an FRS radio. All students must bring a pair of loose fitting leather palm gloves. Bring any other optional winch equipment you have such as a Pul Pal. Make sure your rig is ready to go off-road if needed. Needs to be pulled in two directions at the same time to avoid sliding off. This direct line pull will not work. Once you register, you will receive detailed driving instructions to the meeting point and a check list of items you should bring. As always, the clinic is subject to change due to unforeseen conditions. If you are not satisfied and do not feel you received good value for your money and time, send us an email explaining why and the full price of the class will be refunded, no questions asked. You may keep all handouts as our apology. Before your class, some co-workers asked me, "What do you need to learn about winching? Don't you just hook up to a tree and get yourself unstuck?" After sharing what I learned, they said, "I never thought of that!" and my wheeling friends said things like "Wow, I could have used that on a trip last year."